This is one of my very favorite uses for a rotisserie chicken (and I have a lot!). Leftovers!!! Taking a bit of leftover side dish from yesterday's meal and turning it into something new and better is one of my favorite things. Truth be told, I am usually making extra potatoes just so I can make a dish like this. Bits of this, Bits of that... The recipe below is indeed what I made for the dish photographed. But really this is a "whatever you got" recipe. In the dead of winter when there is nothing really fresh, grab a few bags of mixed frozen vegetables, add taters and chicken and you have a fine meal. Aside from the chicken, I never really shop or even plan to make a Cottage Pie. Just kind of happens when I look at what I have. First, make a roux, in a heated heavy bottom frying pan, melt the butter. Heat to just before it starts to brown Add the flour to the heated butter and stir constantly for 2 minutes. Add the onions and continue stirring for another couple of minutes until the onions are soft. Add the remaining vegetables, mustard, salt and pepper. Bake for 30 minutes, until the potatoes get a crusty top. Cover with foil and freeze if you want to save for a rainy day or Enjoy popping hot and fresh! When serving for presentation, I put the potatoes on the bottom of the plate and top with the soupy chicken/vegetable mix... Heartwarming! 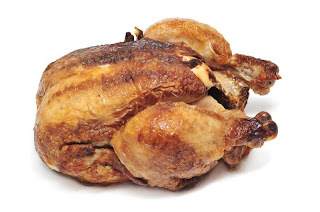 Yes indeed, one of my favorite "52 Uses for a Rotisserie Chicken" (now up to 70!!!). Garlic Garlic Chicken and Dumplings (Red Lobster Copy Cat recipe for Garlic Cheese biscuits used as the dumplings). This recipe only uses a single Chicken Thigh as the chicken ingredient, leaving plenty of the "bird" to continue the challenge. Eat Well... Make something that tastes good. 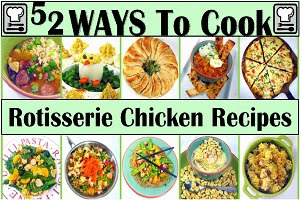 Versatility... Just how many rotisserie chicken recipes are out there??? Keep Track of the costs... Life on a budget, need I explain more? Go beyond the basic recipes and add some tips and HOT TO Photos appropriate for less experienced cooks so that indeed...ANYONE CAN COOK THIS! As to tips... This really is a very easy recipe. Only a few suggestions... Be sure and saute the raw vegetables for at least 5 minutes before adding stock and frozen veggies. The carrots are softened, the onions turn sweet and translucent. 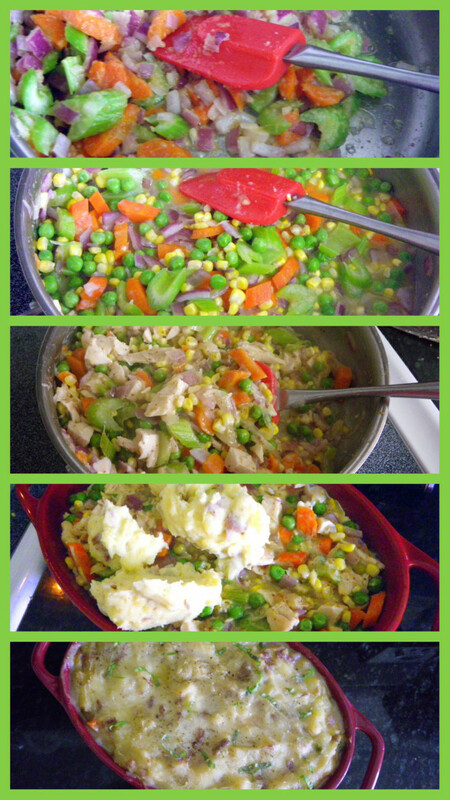 Once you start adding frozen vegetables, add the stock immediately and heat to simmer. This is more of a thick stew than a soup. SO be careful about adding too much stock. You want everything wet and small amount of pooling liquid but do pour too much liquid in. Once you start adding potatoes on the top, it is easier to drop plops of potatoes all round and then smooth those plops around. Add the chicken last minute. You are using a chicken breast which is the most likely chicken part to fry out. Since you are cooking in the stock this is not a big problem, but again, already cooked... no need in cutting the time of fully cooked to over cooked. The chicken averages out to a dollar per recipe. And half cups of frozen vegetables? I buy m frozen vegetables only when they are on sale. SO I get about 4 cups of corn for $0.39 Cents.... Nickle a half cup? Let's be very generous and say fifty cents for the frozen veggies. The chicken stock is free since I had made the stck from the bones of last week's bird. The fresh vegetables (Carrots, Celery and onion) are all bought at a big box warehouse store where I get big bags of onions, carrots and celery for around $10... So, one carrot, couple stalks of celery and half an onion. I am sure a dollar covers that. Total came in at about $3.50... less than $2 a serving for a main course meal in itself!!! A Great meal for the costs! Stay tuned, come on back tomorrow and see what else I make from the single bird! And of course the Rotisserie Chicken makes this easy to make. Making this one of my new favorite additions to my "52 Uses For a Rotisserie Chicken"! Which now has blossomed well over 70 uses with still more to come! What could be easier and tastier? And as always, if you like this recipe and think you might want to give it a try, pin this to your Pinterest Board and be sure to follow me on Pinterest if you want to see the rest of my 52 Ideas (now at 65 and growing)! Just between you and me, let's keep the circle of knowledge small for this one, but Sour Cream in place of milk in a corn muffin mix makes for mist and delicious muffins. When done right (with sour cream), corn bread is fantastic,moist and tender with the grit of corn meal. But when done wrong, corn meal muffins become dry and just nasty texture. Of course, as you can tell, I love to stuff these with stuff... Cheesy (SHARP Cheddar), onion, peppers, sweet corn kernels and CHICKEN... Rotisserie Chicken! 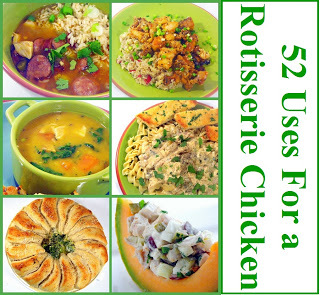 Yes indeed, yet another NEW "52 Uses for a Rotisserie Chicken" (now up to 70!!!). 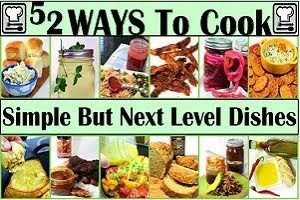 Go beyond the basic recipes and add some tips appropriate for less experienced cooks so that indeed... ANYONE CAN COOK THIS! 2 TBS Whole Milk or Half and Half (as needed). Allow to cool in the pan for 5 minutes, then loosen the edges and turn out. They should release easily. Always Mise en place, means always slice, diced and measure before you start to mix. It really is easier and ensures that nothing gets forgotten. Dicing the chicken is easy, but always sort by hand to make sure that all the bones and all the gristle gets sorted out. Nothing makes you look bad like serving a biscuit with bones. I have already given my secret of using sour cream in place of the milk asked for in the recipe. Your corn meal biscuits will be so much more creamy and delicious! If you look at the photo of the mix immediately to the right, you will see a difference between the next one. I added all the extras (onions, chickens, peppers, etc. ), the mix needed more moisture. I added milk (actually I added 1/2 and 1/2) to make it a bit more soupy prior to cooking. PRE-SPRAY with non stick coating spray. If you do not, the cheese will melt and stick and you will get muffins but they will look pre chewed by the time you get them out of the pan. Also do not over fill. These do expand as they cook. Add a little extra beauty... I like the red pepper rings on the top. Or try gently pressing in some sliced green onions (the chivy green parts) or even a sprinkle of Paprika. Just something for a little contrast. Of course if you can find a heart shaped muffin tin, that gets everyone talking! Allowing them to cool in the pan for a few minutes actually helps them to release. Just don't let them cool too long. A complete meal in itself, pretty and most of all, deliciously sweet and creamy, wonderful texture and DELICIOUS! $1.00 for the Pepper and Onion (partial of each, bag of peppers was $2.00, I did not use 1/4th of the bag. And half an onion. Total came in at about $5.25... 6 Muffins, less than $1 each!!! A Great) breakfast (lunch... Snack) for the costs! This recipe has also been added to my growing list of "52 Uses For a Rotisserie Chicken" (Now close to 100! )...I am so confused... $5.49 for a fully cooked, fully seasoned Oven Roasted, Rotisserie Chicken. Yet shop in the raw meat department and most raw chickens are at best $8 each and usually far closer to $10. Anyone have an answer??? Me either. So, I can either rail against the machine, or learn to embrace the beauty that is the $5 chicken! 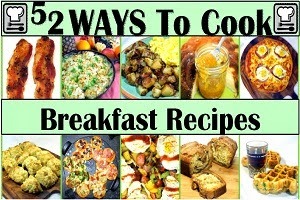 In this pin are recipes I have made, and recommend. MORE than 52 (I just can't stop).. If I die and go to heaven, this is the soup they will serve! Hands down, this is my favorite soup of all time. The dumplings are actually drop biscuits. But not just any drop biscuits, these are the copy cat RED LOBSTER GARLIC BISCUITS I posted about earlier (follow the blue letter or click the photo to see the easy recipe). The biscuit dough is dropped into the soup and poached in the chicken broth as they cook. They also season the soup with garlic as they cook and when you finish them off with garlic butter and chives, the drippings add even more seasoning to the soup. Earlier this month I did a post on making fresh Chicken Stock in a Crock Pot from the bones of a Rotisserie Chicken (same rules, blue letter link or click the photo). First, eat well. Anyone can slice the chicken, add bread and mayo and make a sandwich. I like to use the bird as a base for a good tasting meal... Or a stock that is then used to make a good tasting soup. 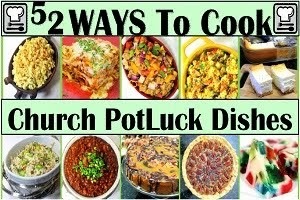 Second, make these dishes for 2. Old farts like Jackie and myself, as well as young couples see lots of recipes that feed 6-8 (or more). In fact, if you read over those "52 Uses for a Rotisserie Chicken." you will see that most of those recipes indeed would feed not only Jackie and myself but our neighbors on both sides as well. 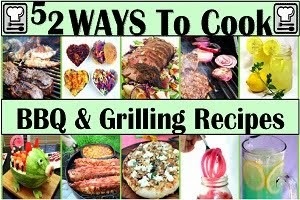 Much as I like leftovers, for a change, here's some recipes aimed at two people. This also allows me to stretch my food budget. Of course the stock is not for two, but can be divided for multiple meals. usually I use about 6 Cups a week. Sometimes more, sometimes less. Third, even though the base of the meal is the same (chicken), I should be able to get 4 or 5 dishes out of a single bird. So let's see what type of variety I can get out of the rotisserie poultry. This week I made 6 dishes and Stock from the single bird... pretty good value for my food dollar. Fourth, keep track of costs. Now this is a little difficult as how much does a couple of TBS of flour cost or an old onion nearing it's prime? So, instead of figuring pennies, let's just agree that pantry items (like flour, sugar, spices) will not be included. Also, I am cheap and I almost always buy things on sale. Case in point, this recipe calls for refrigerator biscuits. If I were going to the store to buy them for a recipe I was going to make today, I would probably buy a generic brand to save money. BUT if you watch the sales like I do and buy extras when I see a good price, you can get a can of Pillsbury "Grands" biscuits, not at the normal $2.50 a can but for $0.99 cents a can. This culinary intellectual challenge is as much about stretching your dollar as it is about eating good. And Fifth and finally, I want to do a few very very basic posts meant for non hobbyist cooks. Look over this post. You will see not only my recipe, a few in focus photos that hopefully make you want to give this a try, but also if you scroll past the recipe you will see some more detailed photos and some detailed explanations of what I did, why and how. 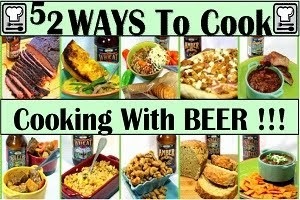 This recipe assumes a couple of things. First that you have chicken stock. Of course I would prefer that you use stock you made yourself with the tips I showed in my post. BUT, store bought from a can works just as well. Next, it assumes that you are using the dough that I made in my earlier post. BUT of course about any biscuit recipe dough will work, even using refrigerator canned biscuits will work. First, Make a roux.... In a large Oven Safe Saute Skillet, heat the butter until melted and warm... Slowly add flour and stir for a couple of minutes until well incorporated. be careful not to burn the roux and stir the entire time. Add the Onions and saute for 3 minutes, until soft. Add another TBS of butter if needed to thin the roux. Add the garlic and stir another 1 minute. Add the chicken stock and stir. Allow to simmer for 30 minutes until the carrots and celery are soft, and the soup has thickened slightly (thanks to the roux). Add the already cooked chicken meat from a rotisserie chicken. Drop the "Red Lobster Copy Cat Garlic Cheesy Biscuits" dough on top of the simmering liquid in spoonfuls, should be able to get 8 dumplings. Bake in the oven for 20 minutes NOTE, this is longer than the biscuit recipe calls for, but it takes that long for the wet bottom of the biscuits (now dumplings) to fully cook. Keep an eye after 15 minutes to be sure the biscuits do not over brown. You may need to cover with aluminum foil. 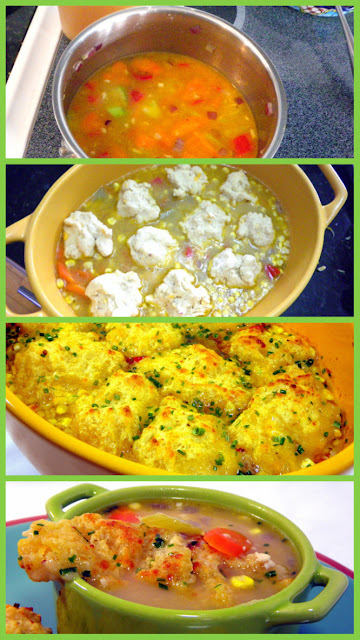 After 20 minutes, remove Chicken and biscuits from the oven, brush on the herb garlic butter mix on top of the dumplings, return to oven, set to broil and broil for 2-4 minutes for the dumplings to brown for an added crunchy texture and presentation. OK... Hopefully you read last weeks set of posts of the 6 recipes I made from a single Rotisserie Chicken. And of course Chicken Stock that I can use this week for soups, rice, etc. 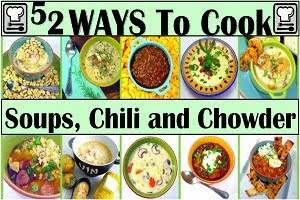 OK... You've seen the challenge, you know the chicken, you will LOVE the soup... Come back the rest of the week and see what I do with the second chicken.! Pay very close attention to making the roux at the beginning... It is easy, and most important, the roux is what makes the broth in the soup thick. The thick broth separates good soup from great soup. Also, the carrots, peppers and celery should all be cut about the same size. Adding the dumplings is nothing more complicated that what it looks like in the second photo. But as they cook, they will puff up and sink.You want that combination of biscuits, cooked to a golden brown deliciousness on the top and soggy dense dumpling flavor on the bottom. Just keep an eye on them. be sure to cook until you get that color and be sure to cook until the bottoms are fully cooked. 20 minutes works about right. Any less and you may have raw dough. $3 a serving (but I did have lunch the next day from this)! Pretty good (great) soup for the costs! Cheesy, buttery soft, DELICIOUSLY Filled with GARLIC! Here's a recipe that's been floating around the Internet and before that it had nearly legendary status as the Red Lobster Cheesy Garlic Rolls. I won't be the first to give the "secret" recipe away, a quick Internet search will show dozens and dozens of bloggers posting this copy cat recipe. But near as I can tell, I could not find anyone dropping these into a soup and making dense delicious dumplings from them. The following directions are for biscuits. If you are making them as dumplings, make the dough, skip the last step and proceed to the Chicken and Dumplings recipe. Add Milk and cheese and knead for 30 seconds. Do not over mix. Divide into 8 Balls, drop on parchment paper lined cookie sheet, Bake for 14 minutes. When biscuits come out of the oven hot, brush with garlic herb butter mix, serve Hot and ENJOY.... bet you can't eat just one. I am learning so much since the first of the year when I decided to concentrate on eating Italian Cuisine (I am laughing calling the series "52 Authentic Italian Recipes"... Laughingly as I passed #52 after week 6, should be 52 weeks... but I digress). I have gotten into the tasty habit of making my own fresh pasta. It really is easy and adds a new level to your dish. But of course a box dry works just fine. It is important that you cook the pasta al dente. This is easiest to just cook one or two minutes less than the directions on the box. the pasta is then loose and will absorb the sauce. A good pasta is coated with the sauce. If you over cook, the pasta is saturated with the water and the sauce only pools at the bottom of the plate. MUCH more flavor if you are careful about how much the pasta is cooked. As to the shrimp, I was lucky enough to find large shrimp on sale. I made this with tiny small shrimp once and it worked well. In fact, one shrimp or more in each bite well. Pre-cooked also works fine, just be sure to cook a bit less in the oil before adding the pasta. Make Pasta according to package directions, minus one minute less than listed for an al dente pasta that will absorb the sauce. Reserve 1 Cup starchy water before draining. Once the oil is close to smoking, add the shallots and saute for 3 minutes. Add the Garlic and continue to saute for an additional minute. Add the zucchini and continue to saute for a couple more minutes. Add additional Olive Oil and allow to come up to temperature. Add the spinach and Shrimp and saute for just a couple of minutes. the shrimp will cook very fast, turning pink and the spinach will wilt. Meanwhile, the pasta should be done. Drain the starchy salty water, reserving a cup to loosen the sauce. Add the Pasta to the lemon/shrimp/spinach/zucchini with sauce and stir to combine. Add additional pasta water as needed to loosen the sauce a bit. The pasta will absorb the sauce, leaving the noodles wet but no additional liquid pooling in the bottom. A winner on every level! So much to this and yet it all comes together so fast. Once you have all the ingredients prepped, the dish is finished in about 10 minutes. Filled with flavors that compliment each other, healthy vegetables and all properly cooked (again, timing on the pasta and only cooking the zucchini to warm and soften a bit... still with a snap). 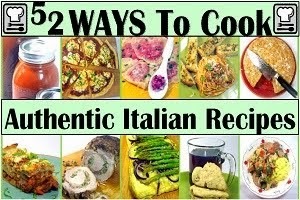 So, I am pleased to list this as one of my Growing list of "52 Authentic Italian Recipes"!!! Well over 52 recipes actually as I just can't stop. The world's most popular cuisine, authentic, natural, organic, Farm to Table... the Italians started, perfected or embraced it before it became a fad. This page is a guide to Italian Cooking... For the home cook! So, Cin Cin (toast) and Buon Appetito (Enjoy your Meal) to you all and let's Cook authentic Italian! Here it is, almost a full week into spring and I have a fresh layer of half a FOOT of snow on top of my grill. This is my version of Southern treat called, Smoky Mountain Snowcaps. Looking out on what I pray is the last snowfall of the season, I felt inspired. These are a chewy almost shortbread texture cookie. Savory and LOADED with Walnuts, Spicy and interestingly flavored with nutmeg and all made pretty (and hinting of snow) by a final dusting of powdered sugar. A grown up cookie, for grown up tastes and delicious! Add eggs one at a time, beating until blended after each egg. Add melted white chocolate and beat well. Allow to cool on the baking sheet for 2 minutes then transfer to a cooling rack. Serve WARM with a COLD glass of MILK and ENJOY!!! 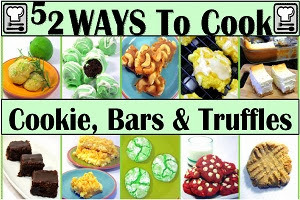 So, I am pleased to list this as one of my Growing list of "52 Ways to Cook COOKIE, BARS and TRUFFLES"!!! Old school like classic criss cross peanut butter to new takes on interesting recipes like a beautiful Red Velvet with the cream cheese mixed inside the cookie, accented with white chocolate chips! Even a Pineapple Cream Cheese EASY Bar with only 5 ingredients! Stop on by, there's always a new cookie in the cookie jar!